When we think of fall, our thoughts may turn toward football, apple orchards and time spent with family in the cooler weather. But for many gardeners, it’s easy to take for granted the importance of autumn landscaping. Spring and summer are the most natural seasons for gardening, but getting dirty in the fall can, in many ways, set you up for a beautiful spring landscape. If planted correctly, most trees, shrubs and perennials will survive the winter months. And for plenty of perennial bloomers, now is an optimal time to show them off while helping them to establish roots. Experts in our area share some tips to help your landscaping project survive the winter and flourish in any season. If they’re cared for properly, garden mums, like these at Countryside Flower Shop, Nursery & Garden Center, in Crystal Lake, can add color to your yard this fall and in the spring. They are a staple in many autumn landscapes, and they come in all variety of colors. 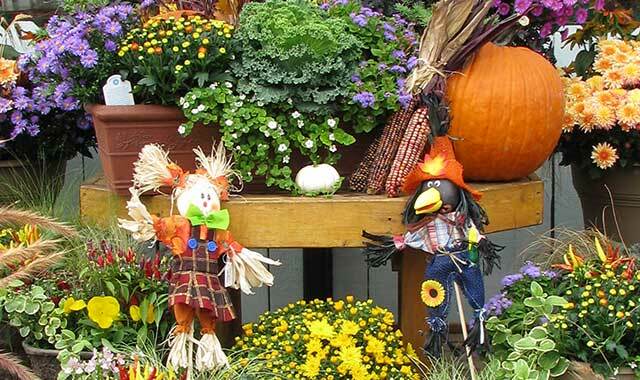 When cared for properly, garden mums can be an asset long beyond the fall season. Mums come in plenty of bright colors including yellow, white, red, lavender, purple, orange and bronze. It’s best to get them into the ground sooner than later so they have time to set roots before winter. A well-rooted plant is more likely to survive the winter. Once you plant your mums, cover them with a layer of mulch, which adds insulation for the plant’s root system now and through the winter. Harms suggests adding about two inches of mulch on top of the soil, being sure to rake it smooth while keeping it away from the stem of the plant. Harms says the people with the most success overwintering their mums avoid the temptation to cut back the leaves and stems after the flowers have died. “The plant will continue to root into the ground as long the leaves are left on the plant,” Harms says. Keep an eye on the weather through September and October. You’ll want to have mums set in the ground and mulched over before the first frost – which typically falls between Sept. 15 and Oct. 15, depending on the full moon. Frost occurs when the overnight temperature falls between 30 and 35 degrees; it usually appears between 4 a.m. and 6 a.m.
It’s possible to extend the life of your plants when you protect them from frost. The night before, cover your mums and other delicate plants with an old blanket, sheet or cloth. Plants in containers can be placed underneath your home’s awning or stored overnight in the garage. 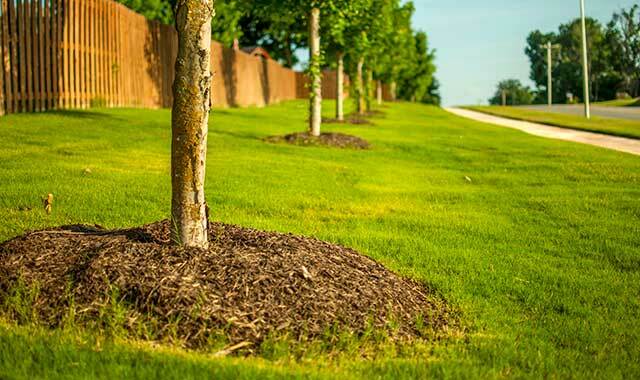 Be careful when adding mulch around your trees. If too much mulch hugs the trunk, the tree has a harder time getting water and oxygen, says Matt Zerby, president of Wasco Nursery and Garden Center, in St. Charles. Just because the temperatures are getting cooler doesn’t mean you can’t plant a new tree. In fact, Matt Zerby, president of Wasco Nursery and Garden Center in St. Charles, plants trees until the ground freezes. 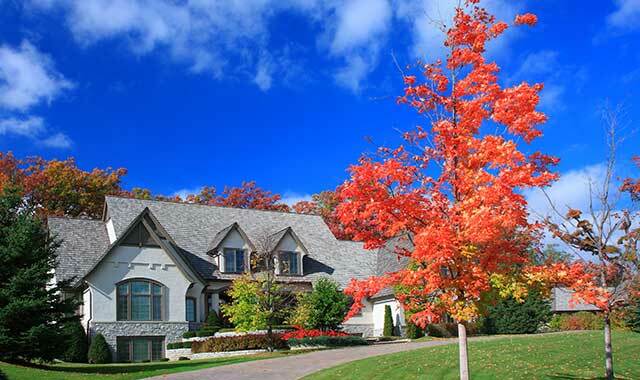 If it’s abundant fall color you’re looking for, Zerby suggests planting a maple tree because it offers good shade all summer while providing bright colors in autumn. He also recommends the autumn brilliance serviceberry tree, a smaller ornamental tree that’s perfect for this time of year. No matter what time of year you’re planting trees, it’s important to keep them watered regularly in the fall. “I normally recommend that people with newly planted trees water them once every two weeks in October and November, and it’s important to do a slow, deep soaking,” says Zerby. A deep tree soaking allows the water to reach down into the root system, which leads to a stronger, healthier tree. Water sprayed rapidly but constantly will tend to evaporate and encourage a shallow root system. This time of year, trees may need a little extra protection against animals, especially from rabbits and deer. During the winter, these critters will be foraging for food in and around your garden and landscaping, and they may damage your trees while they’re poking around. Zerby likes to protect trees with Plantskydd, an animal repellent that smells like predators to deer, rabbits, chipmunks, squirrels and opossums. It comes in granular or liquid form, it’s rain-resistant, and it’s listed as being suitable for organic agriculture. Zerby finds that the owners of new trees make a common mistake when mulching around the base. Many get caught up in “volcano mulching,” where they pile up large mulch pyramids around the base of the tree. And, it’s important to keep mulch away from the trunk. If you’re going to put mulch around your tree, Zerby suggests creating a ring that extends all the way to the dripline, the point at which the branches end, says Zerby. This technique is beneficial because it provides an extra layer of protection against invaders, both of the mechanical and the floral variety. “Sometimes, a lawnmower scrapes up against the trunk of the tree or someone can hit it using a trimmer, which could cause a lot of damage,” he says. Now is a great time to put shrubs in your yard, says Michelle Anderson, vice president of Whispering Hills Garden and Landscape Center, in Crystal Lake. Shrubs can still be planted and enjoyed at this time of year. Shrubs can add beauty and lush color all year long, but many varieties really pop this time of year. The good news is that they can be both planted and enjoyed right now. The hydrangea, with its giant colorful blooms and attractive autumn foliage, continues to be popular among gardeners because of its endless varieties and its ability to take on harsh weather. “Many hydrangeas are repeat bloomers, and the flowers can remain on the plant late into fall and early winter,” Anderson says. Most shrubs can be planted until the first heavy frost, but evergreens should be planted by mid-October. When in doubt during your fall cleanup, it’s probably time to turn to a professional. They have plenty of experience and know the right questions to ask. And, when they help to plan things out, their input can help to avoid headaches down the road. “A little pre-planning goes a long way for easy maintenance with plants,” Anderson says. 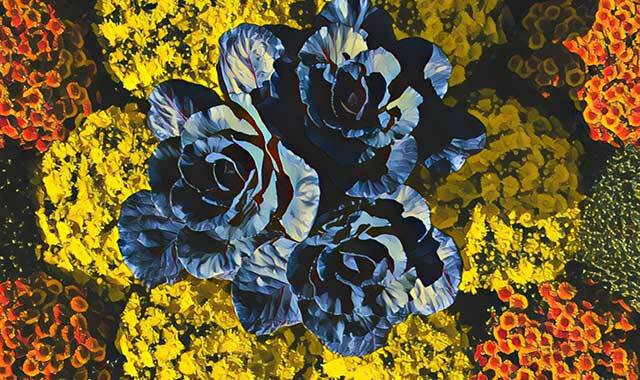 This entry was posted on Monday, September 24th, 2018 at 11:59 am	and is filed under Home & Garden. You can follow any responses to this entry through the RSS 2.0 feed. Both comments and pings are currently closed.